Many major retailers are phasing out single-use plastic bags. Or to be precise, they’re phasing-out free bags. Aldi never gave away bags. K-Mart is phasing out free bags during 2018-19. This is not the first time Target has tried this. They stopped issuing free plastic bags in 2009, but brought them back in 2013. Part of the problem seemed to be that the bags they sold were the same as the previously free ones they’d given away. Other retailers sell higher quality bags. An outright ban has been in place for all retailers in NT, Tas, SA and ACT, plus Qld and WA joined them on 1st July, which no doubt is why the retailers have pushed ahead. Victoria is set to follow at some stage. Unclear what NSW will do. C’mon. If you still want a bag, it’s typically just 15 cents to buy one. FIFTEEN CENTS! That’s just one percent of a $15 shop. For me, the only behaviour change is I now stuff a green bag into my work bag, so I have it for my detours to the supermarket on the way home. We’ll all adapt. 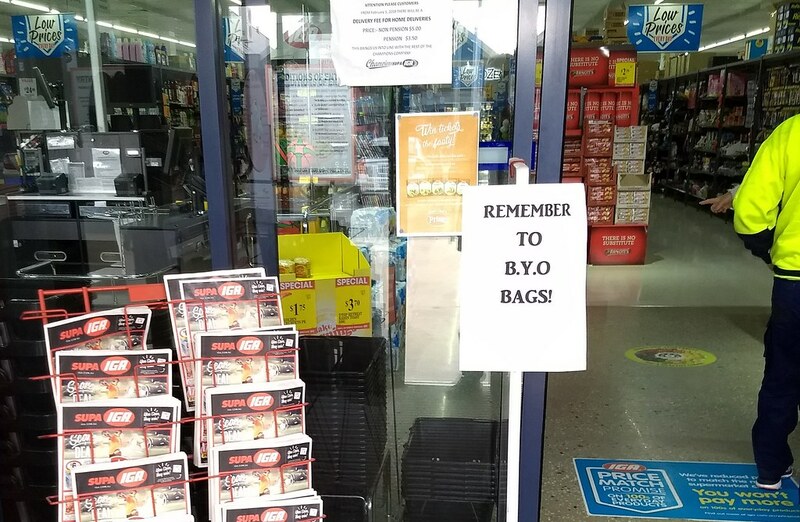 In fact, at this IGA at Nagambie (snapped on 30th June, before Coles switched) the locals seemed to be coping without any fuss whatsoever. Update 2/8/2018: Coles backflipped on 1st of August and made the reusable bags free for an indefinite period. Then the next day they backflipped again, and said the free bags will end on 29th August. The Fisher and Paykel dishwasher, which had been in my house since I moved here in 2005, broke down again. I’d previously thought that, given it was a pretty old model (circa 2000), I’d replace it the next time it failed, so that’s what I did, and found a good price on a Bosch. Why Bosch? The Bosch washing machine I bought nine years ago hasn’t skipped a beat, and they also rate very well on the Choice web site (which is well worth joining if you’re grumpy that The Checkout hasn’t been renewed). I paid the installation fee. While it didn’t take long, it was satisfyingly complex enough that I’m glad I did. Dishwashers aren’t for everybody, but I hate washing dishes, so for me, this is money well spent. 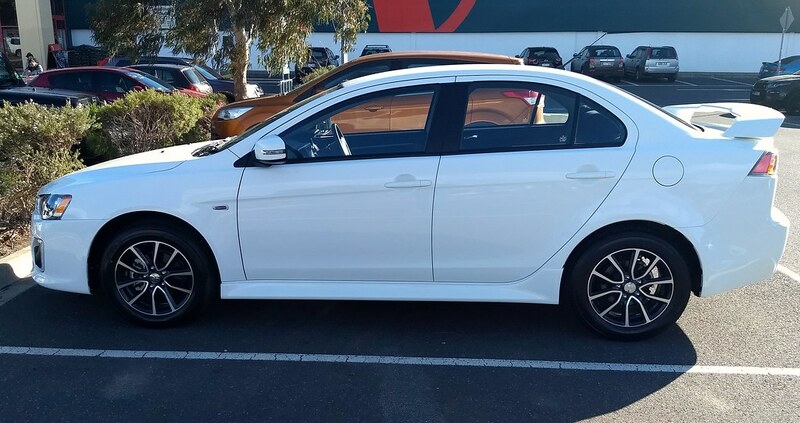 I picked up the new car last night. That’s it above. I suspect the web has changed the shopping experience. I no longer go and look around car dealerships unless I already know what I want. The car dealers I’ve dealt with during this saga seem less slimy than the ones I encountered the first time I bought a car. When scouring Carsales, I had pondered that if I saw the perfect deal somewhere out in the country, I’d be willing to go to grab it. In the end I bought from a local dealership, which will make servicing it with them to maintain the warranty much easier. In fact as part of the handover, they showed me where the service area is, and how the after hours drop-off/pick-up works. Clever. The chief service guy there recognised me from when he used to work on my old Magna years ago. Heh. The dealer bloke showed me the basics of the car, then sent me on my way. Amusingly/horrifyingly I scraped the bottom of the steep driveway just exiting the dealership. Can’t see any visible marks. Also amusingly, I thought the engine was revving loudly on the drive home, until I realised it was in Sports mode, not Drive. Oops. Today I’ve sat in the car for a while with the manual and figured out all the controls. Or at least, the important ones. The psychology of buying a new car and wanting to drive places is powerful. Anyway, I like it so far, though I could do without the spoiler, which I don’t think helps visibility out of the back window. Perhaps I should have asked if the car was available without it. Believe it or not, sometimes I blog about things other than transport. If you want to look purely at transport posts, try this link. 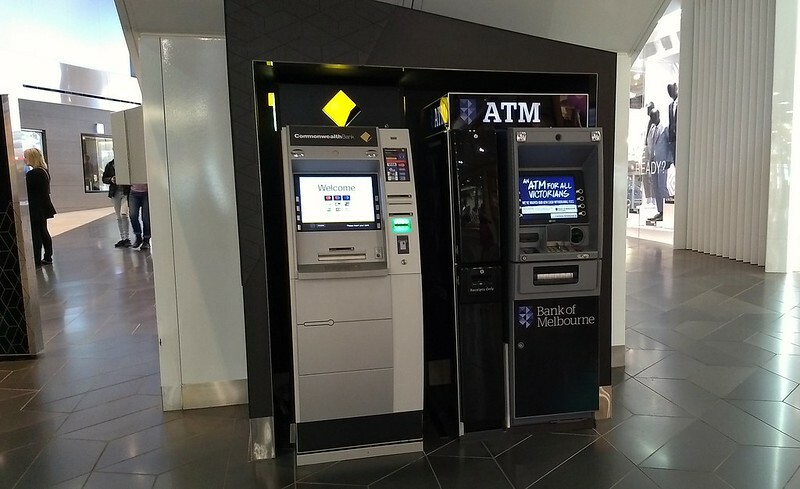 Commonwealth Bank (CBA) announced on 24th September that all their ATMs were free for use by customers of any Australian bank. The same day, the rest of the Big 4 scrambled, and matched that pledge… but CBA had the jump on them, and some of the others couldn’t implement it straight away. It’s not hard to see why the banks are making their ATMs free. Effectively it lets them consolidate their ATM networks, when the use of cash is dropping. 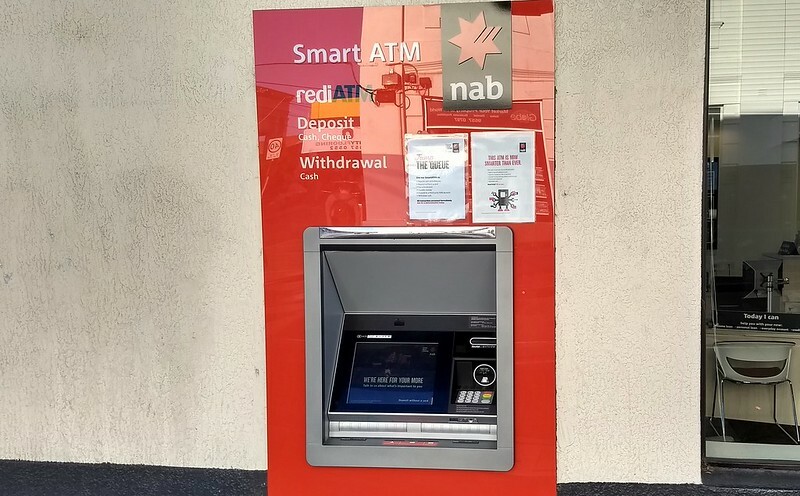 In my suburb, CBA, ANZ, Westpac, NAB and Bank Of Melbourne all have a presence; I haven’t counted, but probably about 8 ATMs between them, within a few hundred metres. Minor ATM brands such as Banktech and CardTronics — hardly surprising they’ll continue to charge. Presumably that’s how they make money. Yes, anyone can use a rediATM as long as your card is accepted, although you will be charged a direct charge fee. To avoid a direct charge fee at a rediATM, your financial institution must be partner of the rediATM network. Update: from 1/1/2019 RediATMs will incur fees for NAB users as well as everybody else. Initially the waiving of fees looks like a win for cardholders, at least Australian ones. Rule of thumb: just stick to the Big Four’s ATMs, and you won’t pay fees. I’m certainly using a lot less cash than I used to, thanks largely to Paypass, so I’m not at all surprised the banks are making moves to reduce the number of ATMs. As you grow older, you find yourself doing things you genuinely had no idea you’d be doing. At least I do. Perhaps other people have all their plans worked out way further in advance. When I was growing up, we had little money, and I couldn’t dream of owning my own home. At age 30 I found myself living alone for the first time, it still wasn’t on the radar. It took me until 35 to get to the point where I could buy. Through my 30s and into my 40s, things have really come together moneywise. Good steady job + low interest rates + house appreciated markedly (I couldn’t afford to buy in Bentleigh now). Last year I wrote about money, and that I was pondering buying an investment property. This came about via refinancing my home loan at the suggestion of my sister, and chatting to a mortgage broker about it. My house was revalued by the bank. It’s worth just on double what I paid for it. Based on that, the mortgage broker said I’d have no trouble borrowing enough for an investment. Rent could be expected to be roughly in the zone of the interest payments. Virtually any other type of investment would have to be self-funded. I’ve dabbled in shares (disastrously), and the bank wouldn’t lend to me to buy a race horse or gold! 10+ year objective: boost my retirement fund, and help my kids buy when the time comes. So I decided to try an investment property. But where to buy? Let’s assume I want something in the same city where I live, rather than some far-flung location. First of all, I’m aiming at something within walking distance to a railway station, shops, parks, other amenity. Similar factors to where I would want to live — it seems to be a good formula. If one assumes the jump in prices has started in the inner-suburbs and is steadily working its way outwards (with gentrification etc), then the strategy is to buy just ahead of that wave. To go with a stereotype, as the CBD gets busier and the commuter population gets larger, then you aim to catch the next lot of CBD white-collar workers moving in. 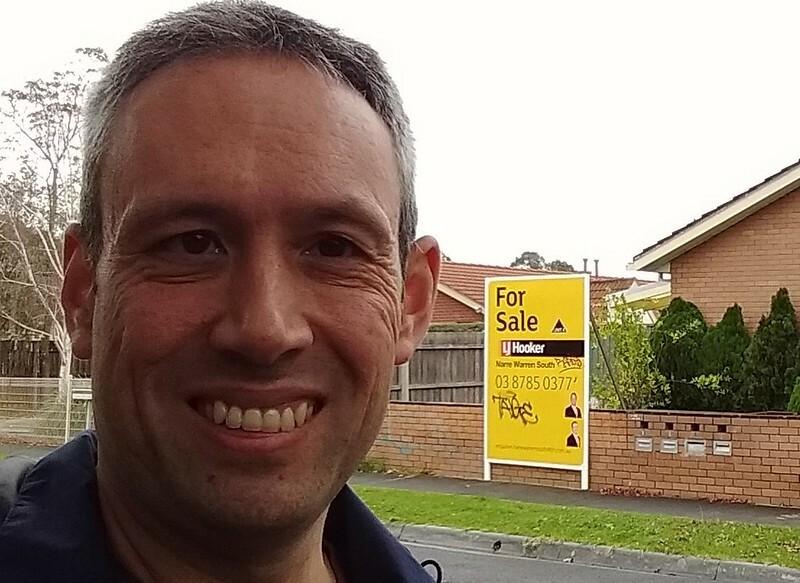 In the Frankston line corridor, this wave of house price rises has obviously already gone through Bentleigh (where I live), Moorabbin, Highett, Cheltenham, but then you get to the beachside suburbs like Mentone which have been expensive for some time. I’ve missed that wave. One could look in other directions, such as west, but what about along the Dandenong line? Oakleigh, Clayton, Springvale have already gone up or are doing so now. For bonus points, look for government infrastructure upgrades in the area to provide a boost, a rejuvenation of some kind. For instance, level crossing removals. Down sides? Well despite being close to Monash Uni, the public transport links to there aren’t very good. In fact all the local buses are fairly appalling. The area has a reputation for crime, though perhaps undeserved. Parts of the suburb seem a little run down, though not really worse than anywhere else. Remember, it’s about investment potential. I’m betting that the whole area will get nicer over the next (say) ten years. Unknown: Will the impact of skyrail be positive, or negative? I’m betting positive. If the open space isn’t totally dominated by car parks, and if they keep it clean, it’ll add to the neighbourhood rather than detract from it. In contrast to areas like Carnegie, where it’s seen as controversial, it seems pretty accepted in Noble Park, in fact I even saw one real estate ad crowing about it. I started hunting for a property late last year. Scoured the web sites, and drove down regularly on Saturdays with M, whose patience never seemed to wear thin. I went to a few auctions, even placed some bids. Gradually it became apparent that some types of property were probably beyond my financial means, if I wanted something in the area most desirable. Finally in May I found something up for private sale, put in an offer, haggled a bit, and it was accepted. A unit, with two bedrooms, at the back of a block of four. Brick, with a bit of a back garden, and very close to the station. So that skyrail had better work out! A great deal of paperwork has followed, including applying again for the loan, even though it was “pre-approved”. But it’s done. I’m buying it. This is going to be interesting. Will the rental return be as healthy as forecast? Will it keep abreast of any interest rate rises? Will the area appreciate like I hope? We’ll see what happens next! A reminder that despite how it may sometimes seem, not all my blog posts are about transport. If you want to view only the transport posts, try here. For convenience, this link is also on the menu at the top, under Transport. Over the years I’ve had many mobile phones. November 2013: Google Nexus 5 — I did that Apple-like thing of preordering this before I’d actually seen it in the flesh. This was a terrific phone. Fast, good camera, great features, no bloatware, and being a Google device, got updates really quickly. 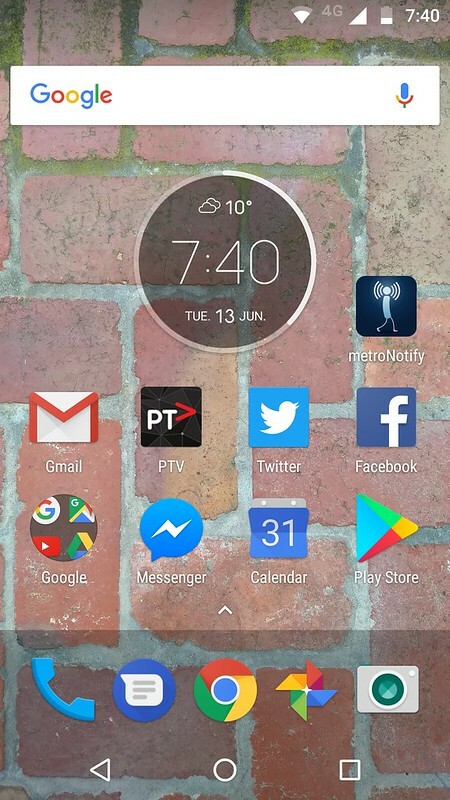 I loved some of the features I only discovered well after I got it, like the pedometer which is now tracking my steps, and NFC, which has all sorts of uses such as checking public transport smartcards (in smart cities like Sydney and Singapore where this is enabled) — see below. Then the phone died in late-2016. The power button got stuck, and it continually switched itself on and off. I replaced it and then stuck it in a drawer until a couple of weeks ago when my son Jeremy needed a phone to use while his was being repaired. He found a way to repair the power button, and it’s still going strong! October 2016: Google Nexus 5X (which cost me $489 at the time) — the spiritual successor to the 5. I really wanted to like this as much as the 5, but I didn’t. It was a good phone, but not a great phone. It feels a little laggy at times. Perhaps that’s one of the perils of buying a phone that was released 12 months earlier. There’s also probably a point at which (for all phones, tablets, and other devices) you should stop installing major upgrades to the operating system, which often bring major new features requiring perhaps more horsepower than the device can provide. Instead, it might be better to just install the security patches… at least until they run out. Having a good, fast reliable phone is more important these days than it has been in the past. I’m not sure that back in the day, any of us Gen Xers really appreciated that by the 2010s we’d literally have such a useful computer that we could carry around in our pockets all day. Get something faster. The 5X was released in 2015. Interestingly, you can still buy it new through some dealers (though Google themselves no longer sell it, having moved to the Pixel — at about double the price). I think there are now better value phones in the $400-500ish range. Fear of the boot loop. I don’t know if it’s common or not, but a known hardware problem with the 5X phone is that occasionally they will get into a state where they continually boot, and (barring hacks to fix it) have to be sent back for repair or replacement. This is something I could deal with at home, but there’s no way I’d want it to happen while on our overseas holiday later this year. Dual SIMs. I’d like to have mobile data for maps and so on while travelling, but I’d also like to be reachable on my usual phone number. Telstra international roaming isn’t cheap: $85 for 300 Mb or $160 for 600 Mb. 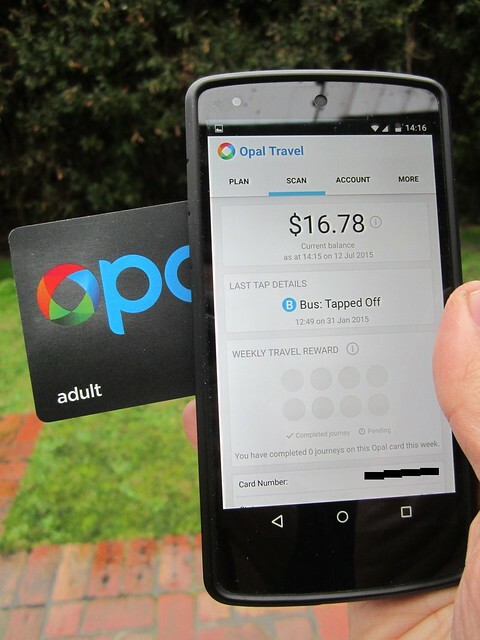 The solution to cheap local rates + keep your usual number? A dual-SIM phone. Use data and outbound calls on the cheap local SIM, and still be able to receive calls/texts on my Australian number. And the money savings will help subsidise the new phone. In fact I suppose I could even choose to use a second SIM at home to get cheap data and/or try and get around the Telstra capacity problems on peak hour trains between Malvern to South Yarra — though from what I’m told, the other carriers are no better. I listed it for $220, and got all sorts of cheeky offers from as low as $130. I refrained from telling them they were dreaming. Eventually accepted an offer of $180 from a bloke who had a Sony phone he quite liked, but dropped it and smashed the glass. Whoops. And the new phone? So far so good, apart from the wallpaper, which I’ve changed to my own design, and the “Hello Moto!” audible greeting, which was the first thing I switched off! How do you effectively wipe an old Android phone to sell it? If it’s Android 6.0 or above, it’s encrypted by default. (If not, switch it on; this could take a while). Then all you need to do is a factory reset. Yes, I use Facebook a bit. But my Facebook friends are my actual friends. You can however Like the blog on Facebook. And PTUA as well! That said, I use Twitter a lot more. I don’t have “get rich quick” schemes. I kind of have “get moderately well-off, gradually” schemes. The worst one has been buying shares. I got a tip that shares in Xero (the online accounting software company) would skyrocket. And they did, from about $6 to something like $40. But that was before I got around to buying them. By the time I bought them, they’d dropped to about $25. They subsequently fell to $15. Currently they’re sitting at $18. I didn’t buy a huge number of shares, but I’ll hold onto them for now rather than sell at a loss. Before Christmas I spotted this at one of the local toy shops: Lego set 21306: the Beatles’ Yellow Submarine. Ooh. Alas, I didn’t get it for Christmas, but I thought maybe I’d go buy it for myself. My mate Josh used to talk about Lego as an investment. 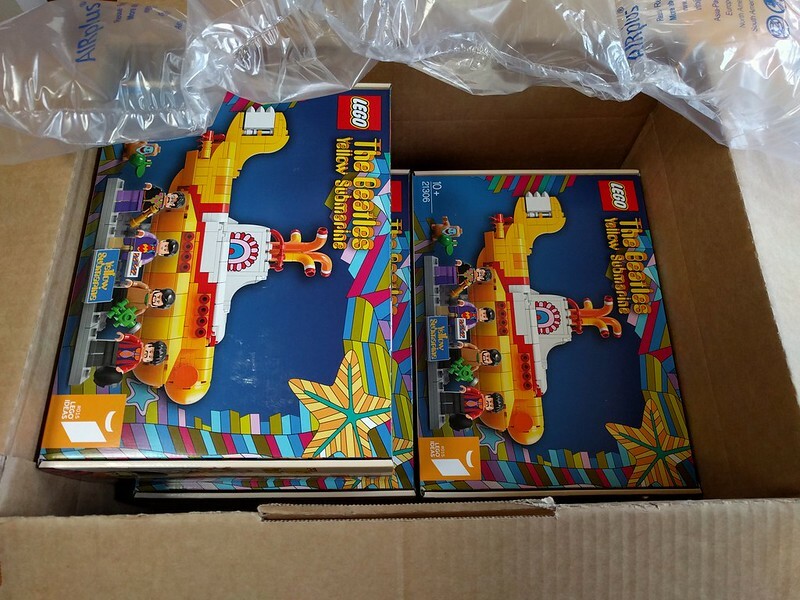 Some Lego sets are very limited runs, and over time become quite valuable, especially if in the original box, unopened. It got me thinking… maybe I should buy two? Keep one for myself; keep the other for, say, five years, and sell it on. I might make my money back, meaning the set I keep is free. It had vanished from the toy shops. All the toy shops. Chains like Big W and Target had it listed on their web sites, but out of stock. I checked a bunch of them, including checking with a friend who runs a shop that sells Lego. No luck. All gone. No more coming. My last hope was the official Lego online shop. The catch is you pay an eye-watering $25-35 for shipping. But wait! Go above $200 and they waive the shipping fee! The set is $80, so including shipping I could order one for $110, two for $195, or three for $240. So I ordered three. This may be my silliest investment scheme yet, though even now the set is listed on eBay at a “Buy it now” price of around $120. Who knows if they’re actually selling at that price. I’ll let you know how it went in about five years.